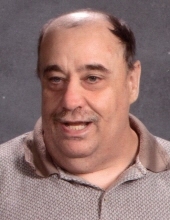 William Erving “Bill” Lewallen, 60 of Fostoria, passed away Monday, March 18, 2019 at Autumnwood Care Center in Tiffin. Bill was a devoted fan of the Detroit Red Wings, Dallas Cowboys and NASCAR drivers, Jeff Gordan and Chase Elliot. He loved listening to his Elvis albums and was a collector of Elvis memorabilia. Bill is survived by his siblings, Marg Blackwell of Augusta, GA, Patricia (William) Plummer of Bradner, Bonnie (Larry) Yaran of Ft. Myers, FL, Marilyn Prowant of Van Buren, Betty Woodruff of Tiffin, Barbara Hock of Fostoria, Carolyn Thoman of Tiffin, Wayne (Rosemary) Latham of New Haven, IN, Donald Mallott of Fostoria and James (Sandra) Lewallen of Fostoria. He was preceded in death by his parents; and siblings, Robert Lewallen, Harold Lewallen, Mary Ann Shank and Kathleen Ellis. Family and friends may visit Friday. March 22, 2019 from 10 a.m. to 1 p.m. at Mann-Hare-Hoening Funeral Home, 407 N. Countyline St. in Fostoria, OH. The Funeral Service for Bill will begin in the funeral home at 1 p.m. Interment will follow in Fountain Cemetery. Bill’s family would like to thank the staff at Melmore Home, Res-Care and Autumnwood Care Center for the care that was provided to Bill during his lifetime. Memorial donations may be given to St. Jude Children’s Research Hospital or Shriners Hospitals for Children. Please share condolences at www.hoeningfuneralhome.com. To send flowers or a remembrance gift to the family of William Erving "Bill" Lewallen, please visit our Tribute Store. "Email Address" would like to share the life celebration of William Erving "Bill" Lewallen. Click on the "link" to go to share a favorite memory or leave a condolence message for the family.